Modern men are daring to go further than traditional wedding bands when it comes to their jewelry. Men’s fashion jewelry is growing in popularity at a startling rate, and we pride ourselves on offering the best selection of men’s accessories at affordable prices to match any budget. Whether you are looking to try men’s bracelets for the very first time or you are looking to add a new bracelet to your collection, look no further. 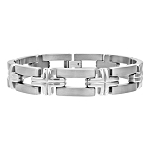 Our dazzling selection of men’s titanium bracelets will give you plenty of style options to match your personality and your special sense of fashion. Explore our eclectic variety and discover your next favorite accessory! Don’t feel left out when it comes to jewelry. Relieve your wrist wear fatigue by trying something a little different than the traditional wristwatch. 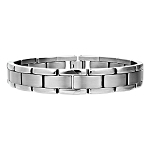 By discovering the many men’s titanium bracelets we have to offer, you can elevate your everyday wardrobe and enhance your overall confidence and swagger. Men’s bracelets can serve as terrific accent pieces in order to top off your outfit with distinctive style. Titanium was first discovered in the late eighteenth century, so it’s no wonder why jewelers and trendsetters rely on its lasting reputation for durability and performance. Titanium is so reliable, in fact, that it’s used in the construction of aircraft and spacecraft projects. 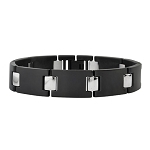 Try something outside of the ordinary and achieve that edgy look you have been longing for by browsing our space-age selection of titanium bracelets for men. We provide alternative fashion bracelets for every style and every budget. Our selection includes popular styles including link bracelets and cuffs. Titanium pairs very well with other metals and alternative materials, so take your pick among our variety of blue or black carbon fiber inlays, cables, and links. If you want to make your jewelry even more unique, explore our diversity in finishes, such as matte or satin polishes. Thanks to our careful attention to detail and commitment to quality, our titanium bracelets for men are built to last and won’t put a serious dent in your wallet. 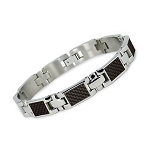 Discover the wonder and brilliance of titanium by visiting our high-end fashion bracelets for men today!